For those who are new to CrossFit it can be hard to read the board. Often there are words or abbreviation that people outside the box have no idea what mean. Read here the list of some of the most used CrossFit concepts explained in a simple way. First of all, the abbreviation WOD is on the table every day and means Workout Of the Day. Usually the whole workout consists of a warm up, skill session and then finally an actual WOD. The wod can be so various, often though based on the skill the coach has been teaching in the first half. It can be short, or it can be long, it can be all sorts, but that is that days task. Amrap is an abbreviation too, it means as many rounds/reps as possible. It is always followed by a number, that number means how many minutes you must work. For example, amrap7, then you do the circuit for the whole 7 minutes before having a break. If it is a competition you have to count the rounds or reps, you do in these minutes to get final score. If it is an amrap you can decide your pace. For example, if the movements are complex you don’t have to go too fast, but if the movements are mostly body weight you can go faster. It all depends on how competitive you are. If you want to squeeze in more reps then your gym buddy you must go faster, if you want to go for quality you go slower. Often it is good to get a goal before starting an amrap. If you think one round will take about 90 seconds, then you are able to finish at least 4 rounds in the 7 minutes and of course you keep counting even though you don’t finish the last round. Emom is the abbreviation of every minute on the minute. My favorite kind of workout. It means that every minute you must start the movement. Sometimes there are alternating minutes, even and odd numbered minutes, on even numbered minutes you do one exercise and the odd numbered another, it is also possible to have 4 or 5 minutes rolling. I like emoms because it is easier to go heavier because you get (often) more rest in between. Depending on the set up of course. A good way to build up strength with cleans or squats is to do emom with just a few reps, so you have time to add the weight you want and get rest before the next set. Every minute on the minute can also interfere with other movements. For example, if the task at hand it to finish 50 cleans, but every minute on the minute you have to do 3-5 burpees. That will slow you down and fatigue the body too. Chipper workouts are always fun. Chipper means that there is a list of exercises that you must finish in that order the coach has listed. It is only one round, but the rep scheme is usually higher than in a regular set up in a circuit. It is because you only do that particular exercise once before moving on to the next. It is so fun to go down the list and check off the ones you have already done and see the task list get smaller. Chippers usually take longer time then a normal wod but are more fun cause there must be so many varied movements in it. Tabata is a style of workout that works with intensity. You go for as many reps as possible in 20 seconds, then rest for 10. Go again for 20 seconds and 10 second break in between for 4 minutes. Usually you pick one exercise for the whole 4 minutes, for example pushups or air squats. It is a typical form for a HIIT which an abbreviation for high intensity interval training is. That is the best way to burn fat. Singlet means one elements workout, couplet has two and triplet three and so on. Element in this case means exercise. Couplets and triplets are popular in CrossFit WODs. On the board it says some number, often 21-15-9. Underneath there are two or three exercises and you must do 3 rounds. In the first you do each exercise 21 times, next round 15 and in the last round you only do 9 reps of these exercises. Of course, the workout can have up to 5 or 6 elements, but two or three is the prime number of exercises. When you start CrossFit you often hear the other ask the coach what the time cap is. The time cap is how long the clock will keep ticking until everyone must stop. You get a task and the time cap will press you to finish. If you finish before the time cap you can rest but it can get frustrating when the time cap closes before you finish. Many workouts are listed as rounds for time, there is often a time cap that the coach decides to press you to work faster. The benchmarks workouts are named after fallen war heroes and tough girls. Benchmark meaning that everyone is doing the same set up and it is fun to do them regularly to see and mark your progress. It is clever to write down your time and what weight you used to see it clearer how the progress is coming along. You know the heroes and girls if you see a name on the board. By the name you know it is not good. Death by will not kill you but you will be defeated. Often is just one exercise, but sometimes it is a couplet or even a triplet. 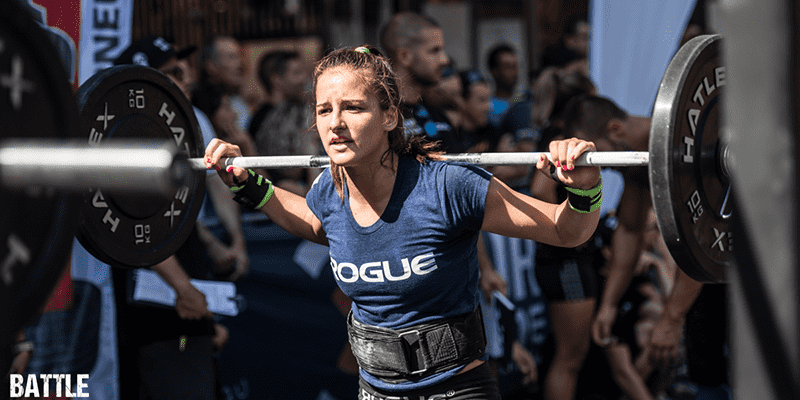 The first minute you only perform one rep, the next minute 2 rep. Then the game begins, how long will you hold out when the reps have gotten up to 10 or even 20, are you still managing to keep up and finish within the minute? If you write down your workout score you must add the details, did you do Rx, meaning the level of work that says on the board. If you have the correct weights and full movements in all the workout you do the workout Rx. But if you have lighter weight or scale in any way, then you are not Rx-ing. Many athletes have the goal to be able to Rx every workout. But beginners should not worry about Rx-ing until their technique is perfect. Scaled version. It is the opposite of Rx. There is nothing wrong with scaling any exercise. But if you change anything from the coaches set up then you are scaling. Unless you are making it harder then you can say Rx+. C stands for clean and J for jerk. Those are often together. The movement is made to get a barbell from the ground to over head in two movements. Resting on the shoulders before getting overhead. Push press or push jerk. Not the same movements and can also be called shoulder to overhead. With the push press it on one movement while push jerk is two. Those two are basically shoulder press with help from the legs. There is one more style of getting the bar over head by doing a split jerk. Toes to bar can be written in these two ways. Toes to bar is when you are hanging from a pullup bar and then raise your legs, so your toes touch the bar. HSPU stands for Handstand pushups. Handstand pushups are basically like pushups except you are not horizontal but vertical while pushing yourself up. K stands for knees 2 or T for to like in toes to bar, and c is for chest while e is for elbows. These two are like the T2B exercise but instead of lifting your legs all the way up you just lift your knees either up to your chest or add some kipping motion in and let you elbow touch the knees. Pistols are not weapons but one-legged squats. The other leg may not touch the ground. It is allowed to hold onto the leg to help with the balance. The c stands for clean, like in clean and jerk. These are some clean variations. PC is power clean. That means that you clean up the bar from the ground and end in a standing position. HPC on the other hand makes the start position shift to over the knees. SC is when you clean the bar up to your shoulders, but instead of having to lift it up to your standing position you let your body go under the bar and end there in a front squat, before standing up. BJ stands for box jump. It is simple just jump onto a box. BBJ is when you add a burpee to the mix. Burpee box jump. The final one is burpee box jump over, where you must go off the box on the other side after jumping on the box after the burpee. Chest to bar. That is a kind of pull up that makes you lift yourself a bit higher than in the pull up, so your chest touches the bar before going down. MU is for muscle up. That is a really complex gymnastic movement where you lift your whole body on the pull up bar, so the hips go over to the bar. End in a dip where you must lock your elbows in the highest position. Over head squat. That is basically a squat where you hold a barbell or any weight over your head the whole time with straight arms. It requires a lot of stability and mobility in the shoulders and hips. Rep is just a curtailment of repetition. You count the reps you make. When the board says 1RM it means that you must get to that heavy load that you can only do one rep max.